Attention Folks - The Folklore Collection is Here! Hot Hot Hot! Shellac and Vinylux do it again with their new Folklore Collection! Man, these colors are sweet! And trust me I've had a good chance to look at them all this week, as every other order was for the Folklore Collection. I think my new favorite color would have to be Rose Brocade (plus it's a sweet name!)... why? I have no idea... I'm just a shipping guy! See our great Shellac & Vinylux Folklore Collection HERE! Now that September is almost over, I am quickly realizing that the holidays are just around the corner. What tipped me off? 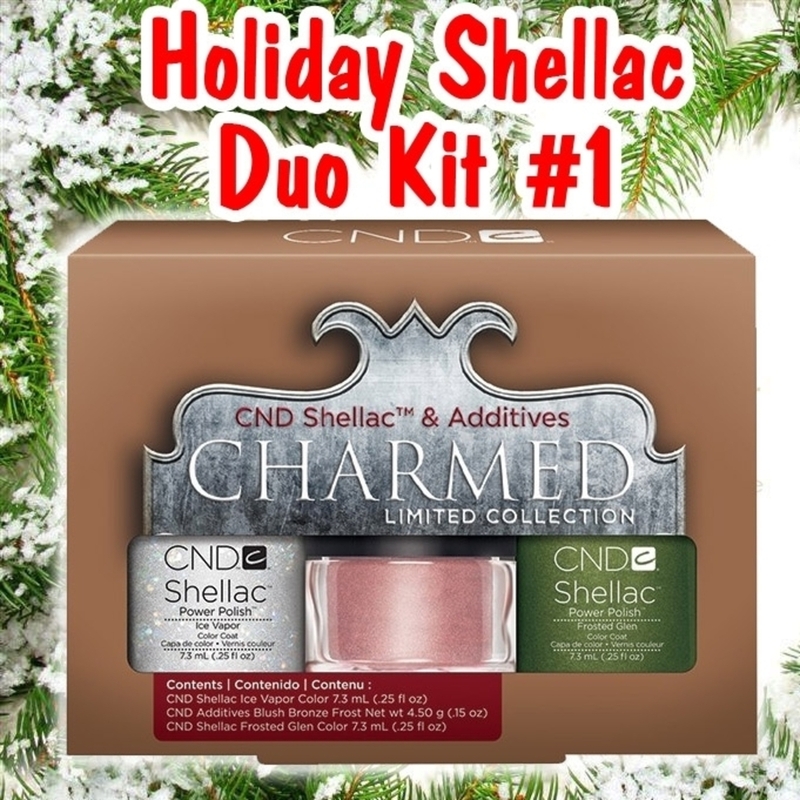 The arrival of the 2013 Shellac Charmed Collection: Holiday Duos and Additives Kit, of course! For the 2013 holiday season, CND has released 2 Holiday Duos, each featuring 2 bright and shiny holiday colors, PLUS a free jar of CND Additives, all packaged in an adorable little box. For my creative clients out there, there is also a Holiday Additives Kit available, featuring 4 special edition Holiday Additives, perfect to help you make this the most sparkly and shiny Holiday Season yet! Shellac Ice Vapor .25 oz. Shellac Frosted Glen .25 oz. FREE Blush Bronze Frost Additive .15 oz. Shellac Serene Green .25 oz. Shellac Scarlet Letter .25 oz. FREE Gilded Gleam Additive .15 oz. Silver Frost Additive .10 oz. Gilded Gleam Additive .16 oz. Blush Bronze Frost .15 oz.